In theory, 3003 aluminum sheet has the same hardness in the two different state, but they are different in the achieving method to the state point. Adding two digits of Arabic (referred to as the HXX state) or three Arabic numerals (called the HXXX state) after the letter H represents the subdivided state of H.
H1—Simple work hardening treatment state. Applicable to the condition that the required strength is obtained only after work hardening without additional heat treatment. H2 – Work-hardened and incompletely annealed state. It is applicable to products whose work hardening degree exceeds the requirements of the finished product, and after incomplete annealing, reduces the strength to the specified index. For natural aged alloys softened at room temperature, H2 has the same minimum ultimate tensile strength as the corresponding H3; for other alloys, H2 has the same minimum ultimate tensile strength as the corresponding H1, but the elongation is slightly higher than H1. .
H3—The state of work hardening and stabilization treatment. It is suitable for products whose mechanical properties have been stabilized after heat treatment or heat treatment during processing. The H3 state is only applicable to alloys that gradually soften (until stabilised) at room temperature. H4—The state of work hardening and painting. Applicable to work-hardening, paint treatment leads to incompletely annealed products. 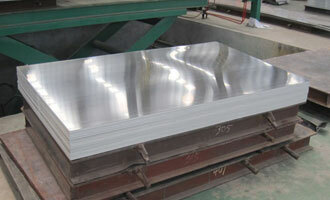 The 3003 aluminum sheet is a typical aluminum alloy Al-Mn which approximately 20% stronger than alloy 1100, this material has good formability, good corrosion resistance and weldability, power battery shell commonly used in the production of automotive lightweight, storage tank, cooking utensils, food warehouse transport equipment, sheet metal pressure vessels and piping. 3003 aluminum sheet react well to mechanical finishing and organic finishes as well. 3003 welding is readily accomplished by means of conventional welding methods but may be gummy if machined. Soldering is limited to the torch method.3003 aluminum sheet is mainly used for manufactured stamped parts because of its light weight and moderate strength. haomei aluminium has a wide range of sizes readily available to the AMS 4008 for H14.